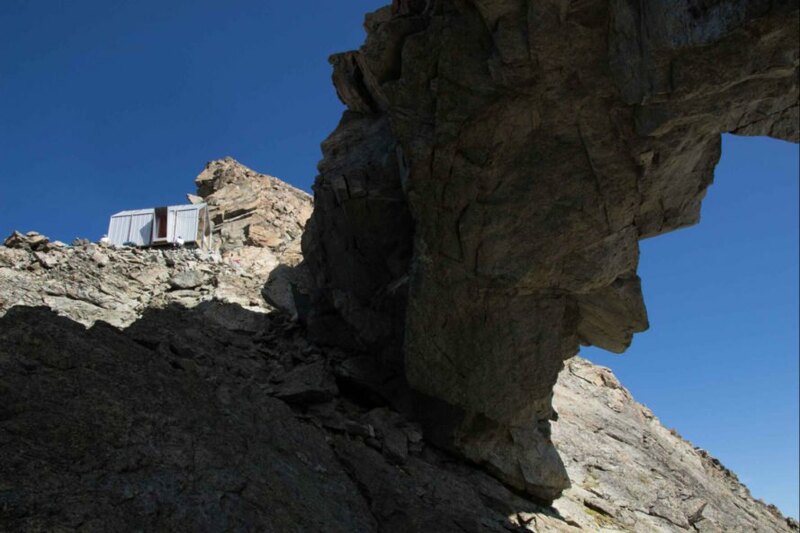 Designed by Italian architects Roberto Dini and Stefano Girodo, the Luca Pasqualetti Bivouac is a prefab mountain shelter that was airlifted to the very peak of the incredibly remote Morion ridge in Valpelline at an altitude of 3290 meters. The tiny bivouac was built with sustainable and recyclable materials and designed to cause minimal impact to the stunning landscape. 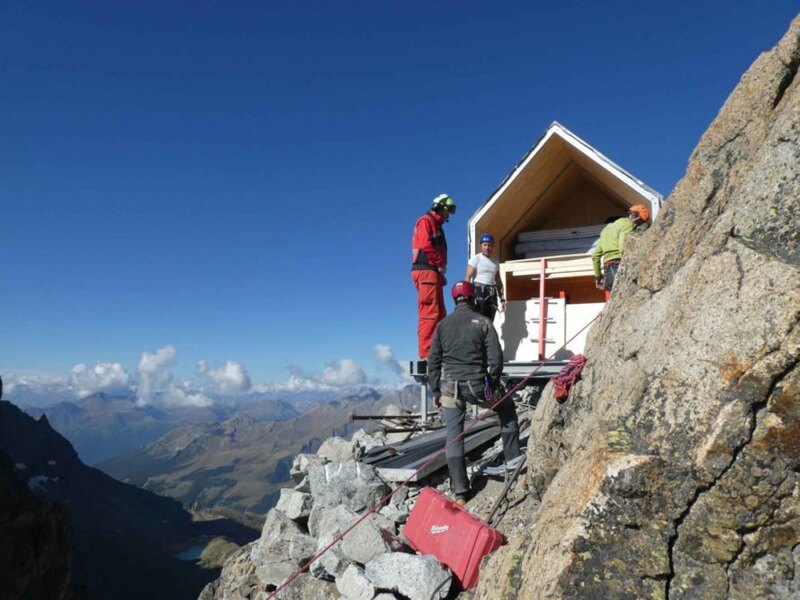 The tiny shelter was the brainchild of a group of local alpine guides called Espri Sarvadzo (“Wild Spirit”). 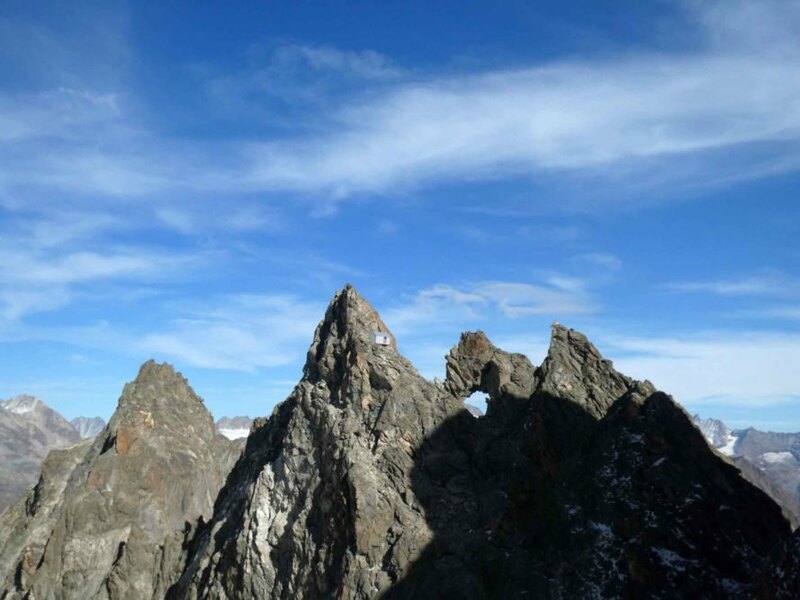 Their objective was to attract more adventurous hikers and climbers to the Morion ridge of Valpelline, which, due to its remote location, is often overlooked. The team worked with the parents of Luca Pasqualettie to dedicate the bivouac to their son who passed away in the same area. The rough location and extreme climate (temperatures reach -20°C and winds up to 200 km/h) in the area meant that the shelter had to be incredibly durable and resilient to wind and snow loads. 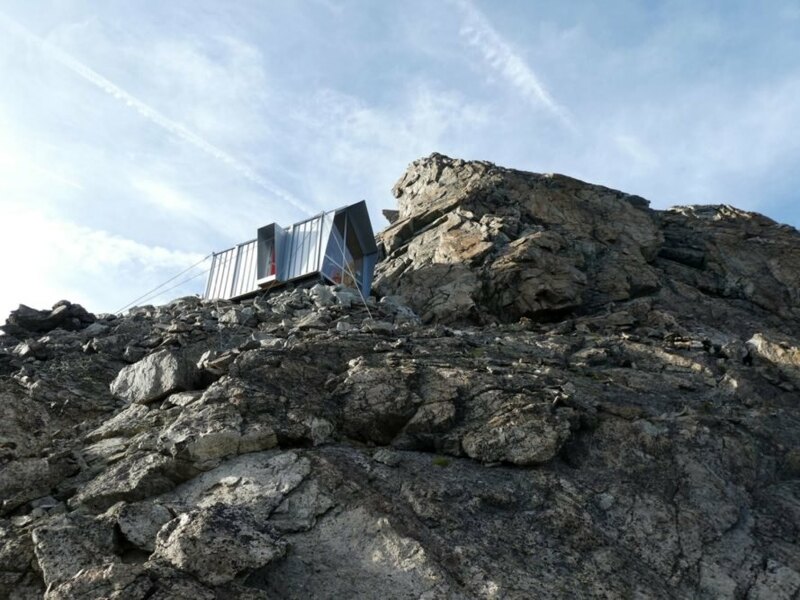 The rugged terrain made building on the site impossible, so complicating the issue further was the fact that the structure had to be lightweight enough to be transported by helicopter to its destination. To bring the project to fruition, the architects designed and built a prefab structure. All of the building’s components, which were chosen for their durability and low-maintenance properties, are also recyclable and ecologically certified. As for the design itself, the shelter is a simple hut with a large pitched roof made out of two composite sandwich panels, wood and steel and can be split into four parts for easy transport. In addition to being sustainable, the design also called for a building that would cause minimal impact on the landscape. As such, the shelter was installed on non-permanent foundations that were anchored into the rock. This will enable the building to be dismounted at the end of its lifecycle without leaving a permanent trace. The interior of the tiny shelter is a minimalist space, optimized to live comfortably in a compact area. A large panoramic window on the main facade was oriented to face the east to take advantage of natural light and heat as well as to provide stunning views. A small solar panel provides additional lighting. As for furnishings, the interior houses a dining table and eight stools, as well as chests for additional seating and storage. There is also a sideboard that folds down for food preparation and various compartments for equipment. At the rear of the shelter‘s living space is the sleeping area, which is made up of two wooden platforms with mattresses and blankets. 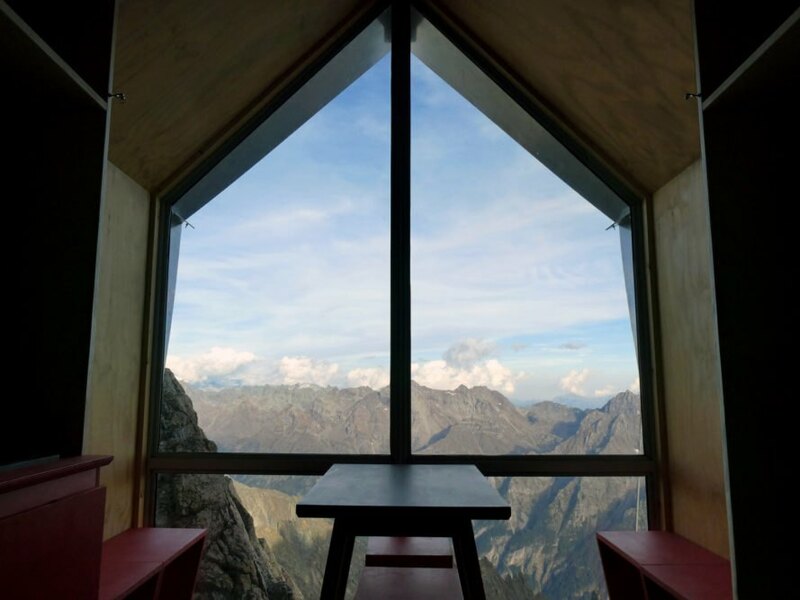 Sitting perched onto the rocky peak, the shelter provides a space to wait out bad weather. The extreme climate and rugged terrain posed a challenge for the architects. The shelter was designed to bring more hikers to the remote area. The shelter had to be resilient and durable. 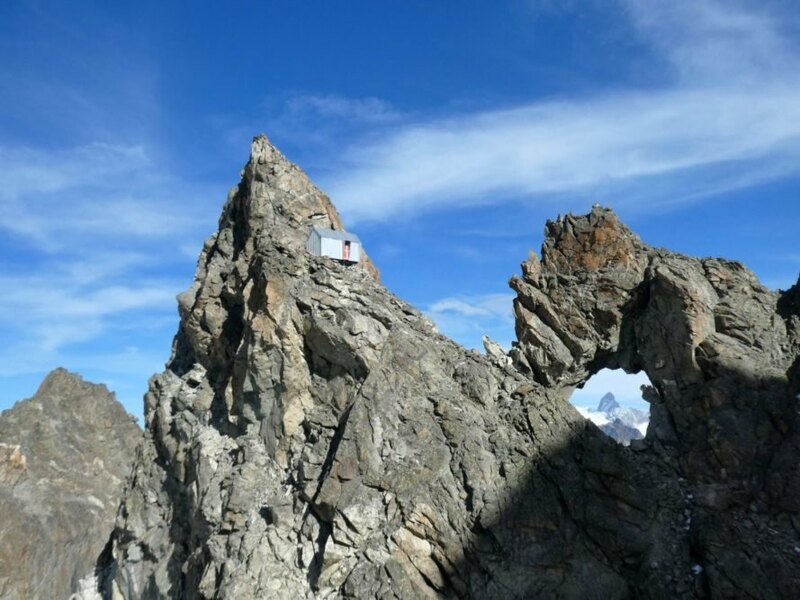 The bivouac is located in the rocky Italian Alps. The shelter is broken up into four parts for easier transport by helicopter. 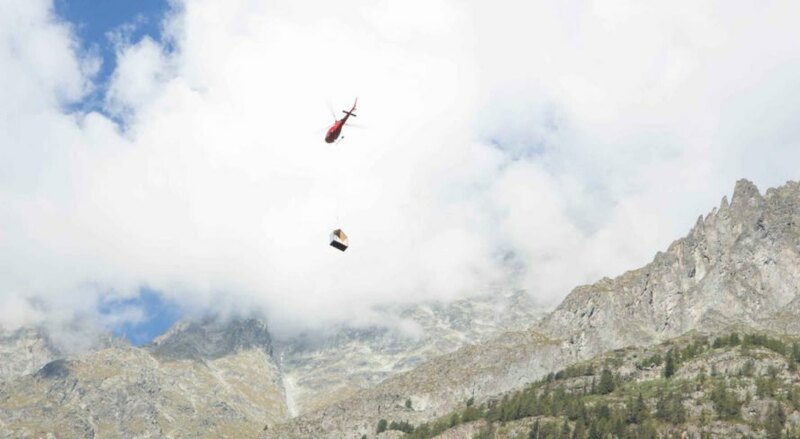 The shelter was lifted into place via helicopter. 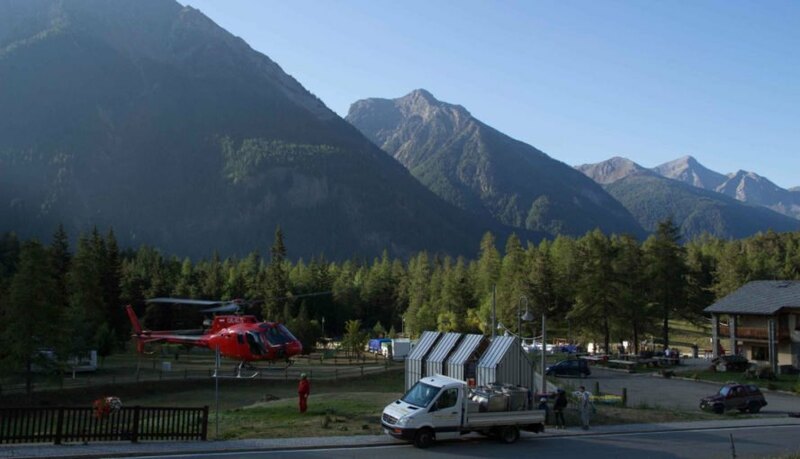 The only way to install the shelter was by helicopter. 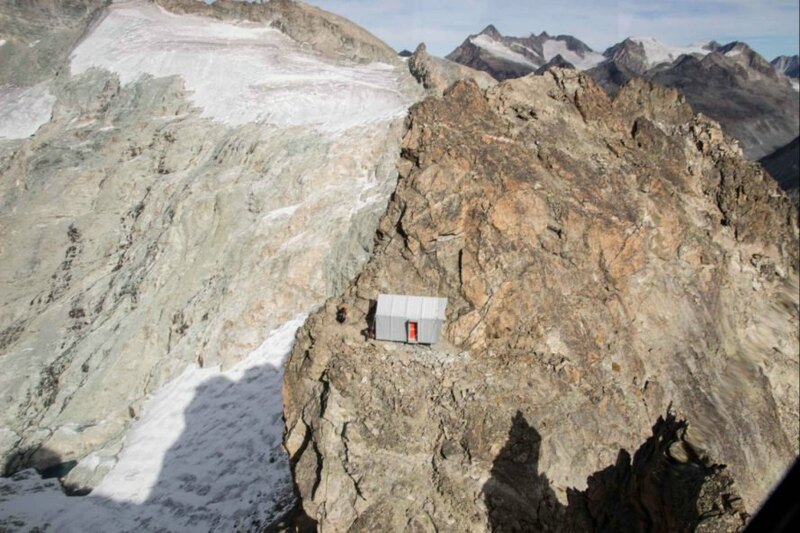 The bivouac is placed on a non-permanent platform that can be easily removed. The shelter is perched lightly on the land. The interior of the cabin has a table with eight seats and multiple mattress. 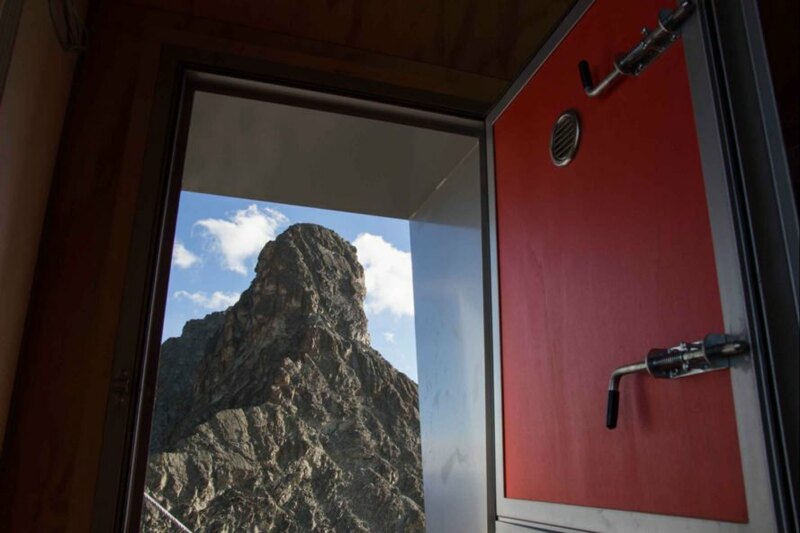 Inside, the cabin provides unbeatable views of the Italian Alps. The 140-square-foot shelter was designed by Roberto Dini and Stefano Girodo. The bivouac was built into the well-known peak called Becca Crevaye.